The tiny fishing community of Deeper Harbour is in deep trouble—and so is fourteen-year-old Roland MacTavish. Roland’s mom wants to move with him to Ottawa, away from his father, his weird friend Dulsie, and his even weirder grandfather, Angus. So Roland does what any sane teenager would do: He invents a sea monster. Unfortunately, the scheme quickly spins out of Roland’s control, and he has to go to greater and greater lengths to keep up the illusion. And then Roland must deal with a situation far more terrifying than any sea monster. As moving as it is irresistibly funny, Steve Vernon’s portrait of Roland and Deeper Harbour is perfect for anyone who’s ever been stuck badly enough to do something awesomely, brilliantly, heroically stupid. This book started right into some action, with Roland’s grandfather and as friend breaking him out of jail. It took a little while to get to the main problem of the plot, but I kept reading because of the quirky characters. I was glad I did. Once the story got going, I enjoyed the humor and was rooting for the characters to succeed in their plan to build and deploy a fake sea monster. The author captured the feeling of community and small town Nova Scotia. As a writer, it was so interesting to see how the author brought together characters of different ages as they worked together on a project. And I loved the way the humor seemed so effortlessly woven into the story. Steve Vernon is a writer and storyteller who lives in Nova Scotia with his wife and a cat named Kismet. Sinking Deeper is his first middle grade novel. He also writes collections of ghost stories. 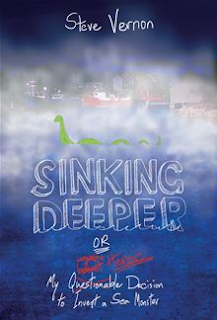 Sinking Deeper Or My Questionable (Possibly Herioc) Decision to Invent a Sea Monster is nominated for an Ontario Library Association's Forest of Reading award in the Silver Birch category for 2013. Other nominated books that I’ve featured include: Dragon Seer's Gift by Janet McNaughton, Cat Found by Ingrid Lee, A Tinfoil Sky by Cyndi Sand-Eveland, The Mighty Miss Malone by Christopher Paul Curtis, Making Bombs for Hitler by Marsha Forchuk Skrypuch, The Dead Kid Detective Agency by Evan Munday, The Grave Robber's Apprentice by Allan Stratton, Missing by Becky Citra, and Neil Flambé and the Crusader's Curse by Kevin Sylvester. For more info, visit Steve Vernon’s website. Marvelous Middle Grade Monday was dreamed up by the incredible Shannon Messenger, author of the middle grade novel, Keeper of the Lost Cities. Visit her blog for an up-to-date list of all the bloggers who are participating and posting about middle grade books today! Share a little about how you ended up as a writer? My dream to write a children’s book was born during my first few years of teaching. I was a third grade teacher for 13 years, and I LOVED teaching reading. I LOVED the books my students were reading, and I LOVED reading aloud to them. That’s when I decided I wanted to write a children’s book. My ideas for stories almost always start with a character, and that’s how THIS JOURNAL BELONGS TO RATCHET started. I had the idea for a main character nicknamed Ratchet, and then I began to let my imagination create her story. Ratchet tells her story through the assignments in her homeschool language arts book, so the most challenging aspect was figuring out a way to tell an entire story using so many different writing forms. Though it was the most challenging part about writing the book, it was also the most fun and creative parting of writing it. Each book I write teaches me something about the world, myself or the process of writing. What did you learn through writing this book? I would have to go back to the previous question for this one. The format taught me how to be open to different writing forms and also taught me how important it is to let a story evolve and grow. I really had to figure things out as I went along and in order to do that I had to allow myself room to make a lot of mistakes. I tried a lot of things that didn’t work before I found things that did work. Because I love reading as much as I love to write, I’m always curious about what other people like to read. Do you have any favorite books? I have too many favorite books to list, but I will tell you some of my all-time favorite authors: Beverly Cleary, Katherine Patterson, Madeleine L’Engle, Cynthia Rylant, and Anne Lamott. My next book will be another alternative format – not a language arts journal, but something somewhat journal-like. Thank you, Nancy, for stopping by my blog for an interview. I'll be watching for your next book! Meet Ratchet, an 11-year-old girl who knows more about spark plugs than sleepovers. Homeschooled by her mechanic-environmentalist dad, and with her mother long dead, Ratchet only wants one thing: to belong. 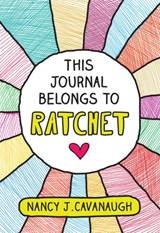 This is Ratchet's journal and in its pages are Ratchet's writings, her poems, and her drawings. Together, they tell Ratchet's story. It's a story about trying to make friends, about fighting to save a park, about the memories of her mother, and about her unlikely friendship with a boy. This journal is her sanctuary. And it's always there for Ratchet when no one else will listen. I really enjoyed this story! Ratchet's determination and struggle to get her dad to notice her and to fix her life so she’d have friends and some recognition for her unique talents kept me hooked. I enjoy reading about characters with unique interests (like Ratchet’s mechanical ability) in out-of-the-ordinary situations, so this book held my interest all the way through. I also really liked the format of the book. The story was presented through Ratchet’s home-school assignments, so each page had a different writing style. As a writer, it was so interesting to think about how the story continued even though each scene was structured in a different writing format (poems, personal essays, and even a fairytale). I would read this book again to study how the author wove in details of Ratchet’s character and her goals throughout the story. This is Nancy Cavanaugh's first novel. Her dream to become a children’s book author began in 1994. She stuck with her dream for many years because she loves to write! 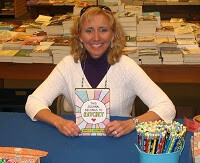 Watch for an interview with Nancy Cavanaugh on this blog on Wednesday! For more info, visit Nancy Cavanaugh’s website. For Tetsu, baseball is so much more than just a game. 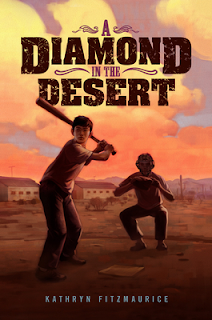 On December 6, 1941, Tetsu is a twelve-year-old California boy who loves baseball. On December 7, 1941, everything changes. The bombing of Pearl Harbor means Tetsu's Japanese-American family will be relocated to an internment camp. Gila River camp isn't technically a prison, but with nowhere to go, nothing to do, and no time frame for leaving, it might as well be. So when someone has the idea of building a baseball diamond and starting a team, Tetsu is overjoyed. But then his sister gets dangerously sick, forcing him to choose between his family and his love of the game. This is an impeccably researched, lyrical story about baseball, honor, and a turbulent period in U.S. history. Since I’m not a big baseball fan, I was surprised at how much I enjoyed this book. I loved the poetic writing style and it was interesting to learn a little about this period in history and the terrible indignities of life in a Japanese internment camp. I felt an emotional connection the main character, Tetsu, and his family, and anger that people had to endure this life. It’s a quieter story, but it’s not lacking in tension. The short chapters made this easy to read and gave space for the reader to process story events. As a writer, I’d return to this story again to study how the author truly made every word count. The writing seems deceptively simple, but it creates a lot of emotion for the reader. Kathryn Fitzmaurice is a full-time writer who lives in California. She became interested in writing at a young age, after visiting her grandmother, a science fiction author. A Diamond in the Desert is based on a true story. According to her blog, Kathryn did two years of research for this book, reading every newspaper printed at the camp and interviewing three of the players on the team, who were still alive and in their 80’s. The film rights for A Diamond in the Desert have been purchased by Dyson Thomas Films, LLC. For more, visit Kathryn Fitzmaurice’s website. 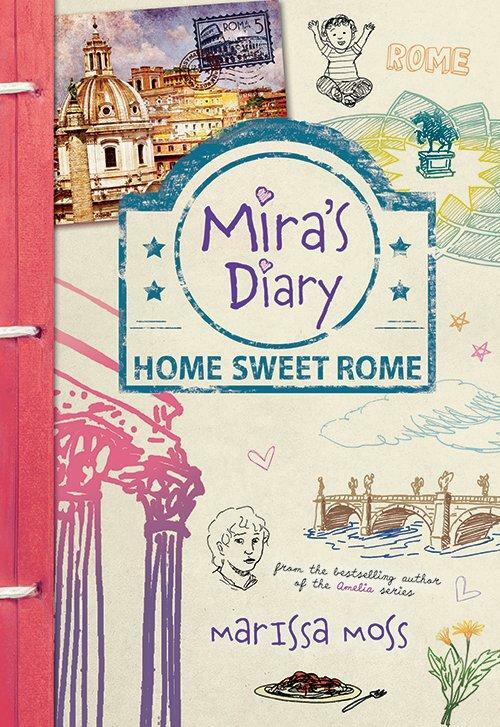 I'm so excited to be part of the Mira's Diary: Home Sweet Rome blog tour! 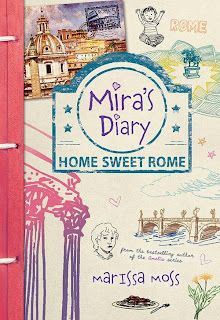 Today I'm delighted to share an interview I did with Marissa Moss, whose latest middle grade novel, Mira's Diary: Home Sweet Rome was recently published by Sourcebooks. Mira was prepared to travel the world to find her mother—but she never expected that she’d have to travel through time as well. When Mira’s search transports her to 16th century Rome, she befriends the famed painter Caravaggio and falls into his group of scientists and fellow artists. But Mira quickly realizes this is no place for forward thinkers and is soon faced with protecting her new friends from the evil Madame Lefoutre. Mira’s outmatched 5,000 miles (and 500 years) from home, but she’ll have to succeed if she ever hopes to be reunited with her mother. Marissa Moss has published over 50 children’s books and her illustrated Amelia series sold more than 2 million copies. Although she hopes to visit all the wonders of the world, right now she lives in the San Francisco Bay area where she can appreciate the Golden Gate Bridge from her window. Visit her at www.marissamoss.com. I sent my first books to publishers when I was 9, but it wasn't very good and, of course, it didn't get published. I didn't try again until I was a grown-up, but I kept on telling myself stories and drawing pictures to go with them. The first Amelia's Notebook was based on my journals, in fact. I knew I wanted to write about Caravaggio because he's such an intriguing character and I love his paintings. Once I was in that time period, the Inquisition, papal politics, a burning at the stake or two, were all bound to come up. It's always hard to balance complicated information with strong plots that will draw in readers. When you're dealing with another century, it's harder still. I wanted Rome, both in the present and in the past, to be vivid, to come alive for the reader. The city felt to me like another character and I hope I brought her to life! I learned a tremendous amount researching the period, about Galileo, Bruno, 17th century Rome, Caravaggio. I'm not sure what I learned about writing, but I learned a lot about taking risks, staying true to one's vision, fighting for one's beliefs. And that period felt like a time when science, philosophy, literature, art were all fluid, all part of the same kind of thinking, not separate like they are today. No wonder somebody like Leonardo da Vinci could thrive then. Wow! One of the great things about writing is that it lets you explore things that catch your interest. Because I love reading as much as I love to write, I’m always curious about what other people like to read. Do you have any favourite books? I read widely and I'd have to say the most interesting thing I've read lately is an adult book (usually, I'd say middle-grade or YA, there's so much great stuff). But I loved Gone Girl for the way you start out liking one narrator and hating the other, then you hate the narrator you liked and like the narrator you hated, and the ending is a complete surprise. Talk about mastery of character and plot! Definitely something I'm still working on. I'll have to check that book out. Is there anything else you’d like to share about your book or an upcoming project? 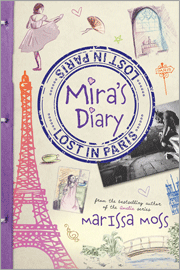 I'm working on the third Mira's Diary right now. I'm at that terrifying point when I'm not sure if I have a book or simply a pile of pages. We'll see. . . Thanks, Marissa, for dropping by the blog and talking about your writing process. I love learning about how stories develop! When Mira receives a cryptic postcard from her missing mother, she sets off with her father and brother to find her in Paris. Only Mira doesn't know she's looking in the wrong century. With an innocent touch to a gargoyle sculpture on the roof of Notre Dame, Mira is whisked into the past. There she learns her mother isn't just avoiding the family, she's in serious trouble. Following her mother's clues, Mira travels through time to help change history and bring her mother home. I’m not a big fan of time travel books, but it was interesting to read about the historical events of the Dreyfus Affair from Mira’s perspective. I liked the details of life in Paris in a different time period. And since I love artwork by Degas, I especially enjoyed the parts where Mira visited his studio. There is a lot of history and politics in this book, and although these issues are nicely woven in to Mira’s hunt for her mother, some readers might find it a bit slow-paced. This book deals with issues of prejudice and anti-Semitism. Marissa Moss is an author and illustrator who lives in the San Francisco bay area. Watch for an interview with Marissa Moss about her writing process on this blog on Wednesday! For more info, visit Marissa Moss’s website. Marvelous Middle Grade Monday was dreamed up by the amazing Shannon Messenger, author of Keeper of the Lost Cities and Let the Sky Fall. Visit her blog for an up-to-date list of all the bloggers who are participating and posting about middle grade books today! The sudden disappearance of Neil’s skills in the kitchen is the real mystery in this culinary caper. Is a curse to blame? 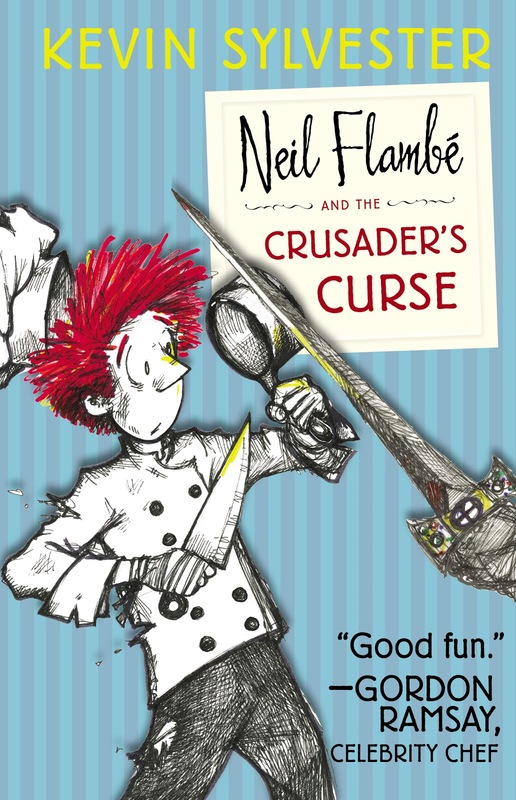 I’ve read two of the other books in the Neil Flambé series and I enjoyed this one as much as the others. The book has an over-the-top sense of fun that keeps you wondering what will happen next. I found it a little confusing at first because some of the book takes place in the past, with Neil Flambé’s ancestors, but all the pieces come together later in the story – with the usual edge-of-your seat adventure that I’ve come to expect in a Neil Flambé caper. From a writer’s perspective, this book offers a chance to study a distinctive voice and how to include humor. Since these books are funny but also contain a lot of action, I can see why kids enjoy them so much. Kevin Sylvester is an author-illustrator who lives in Toronto. To hear an interview with him, check out this podcast from Authors Like Us. Kevin has some tips for drawing Neil Flambe on the Simon & Schuster website. And you can see Kevin Sylvester talking about which book he would save from a burning library in this video to promote reading by the Toronto Public Library. 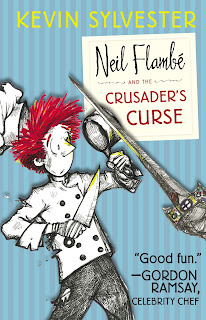 Neil Flambé and the Crusader's Curse is nominated for an Ontario Library Association's Forest of Reading award in the Silver Birch category for 2013. Other nominated books that I’ve featured include: Dragon Seer's Gift by Janet McNaughton, Cat Found by Ingrid Lee, A Tinfoil Sky by Cyndi Sand-Eveland, The Mighty Miss Malone by Christopher Paul Curtis, Making Bombs for Hitler by Marsha Forchuk Skrypuch, The Dead Kid Detective Agency by Evan Munday, The Grave Robber's Apprentice by Allan Stratton, and Missing by Becky Citra. I have previously featured Neil Flambe and the Aztec Abduction, a nominee for the 2012 Silver Birch Awards. Marvelous Middle Grade Monday was dreamed up by the incredible Shannon Messenger, author of Keeper of the Lost Cities and Let the Sky Fall. Visit her blog for an up-to-date list of all the bloggers who are participating and posting about middle grade books today!